It's easy to get caught up in the day to day life and not appreciate the leaps and bounds your baby has made in their first year. I'm so glad I have so many photos and videos of Louella as a new born as it truly puts into perspective the massive growth that happens every single day. The past month has seen a lot of changes in our baby. She's been using "whatsthat", pointing at everything, shaking her booty to anything with a beat (sometimes I just have to clap), walking along the edge of the couch, using "Dada" appropriately instead of for every word (Mama... anytime now, please), teasing us with her treats (pulling them away before we can have a taste) and recognizes words and hand signals (pointing at "light", knowing "hungry", "outside", waving, high five-ing). Her favourite chores are washing baseboards with me and folding, unfolding, and refolding clean laundry with me. She can eat even more than her dad in a sitting (and that's saying a lot). She wants to try every flavour and is absolutely devastated when her plate is empty. That said, she still breastfeeds constantly. I think that it has to do with comfort during the teething period. Sometimes she can get a bit fussy about the pain (we've only had 1 or 2 bad afternoons) but in general she is just a completely calm and good natured human. To celebrate my turning 30 this month, we went to New York to experience it at Christmas for the first time. Unfortunately Jakob had a lot of work, plus he just fractured a vertebrae while snowboarding, so we left him behind to man the fort. Our travel buddies were my dad, mom, sister, brother & his girlfriend. It was an awesome 5 nights although the red eye flights were trying on a very curious 1 year old (and her pregnant, tired mother). She pulled 2 all nighters. So I did, too. Advice to future self (which I'll willfully ignore because I can never resist a trip): don't take over night flights with a toddler (even if it is business class - it's a very small consolation). The biggest thing on the bucket list was, of course, Rockefeller Centre. Here we are with my sister, Jayde, and the beginning of baby bump #2. 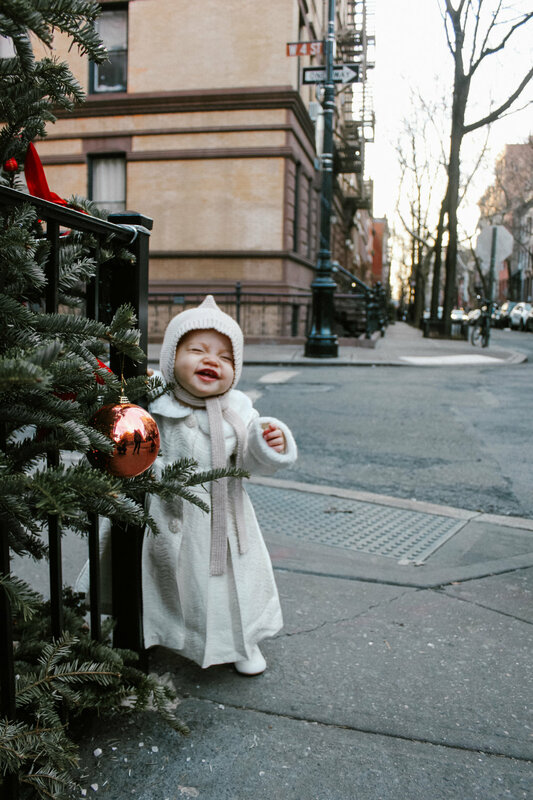 Here Louella is in an outfit I bought at Macy's (now they know how to do Christmas). 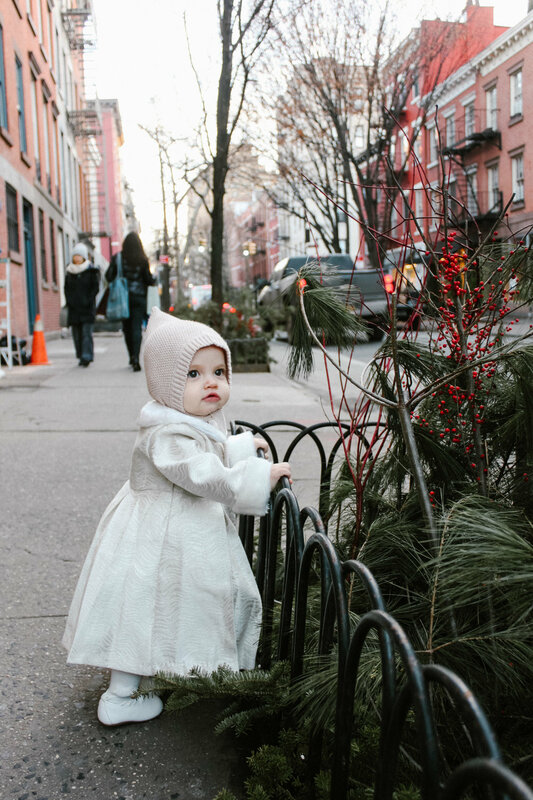 My mom and I hit the West Village to walk around Carrie Bradshaw's neighbourhood snapping photos of my little doll. This is literally exactly what I imagined when I dreamt of having a daughter. January 3 is her first birthday. We're having 2 gatherings - one for family and one for friends. Mostly my friends. Ok, so it's a party for me. But I'll make sure Louella has fun and it isn't during nap time.